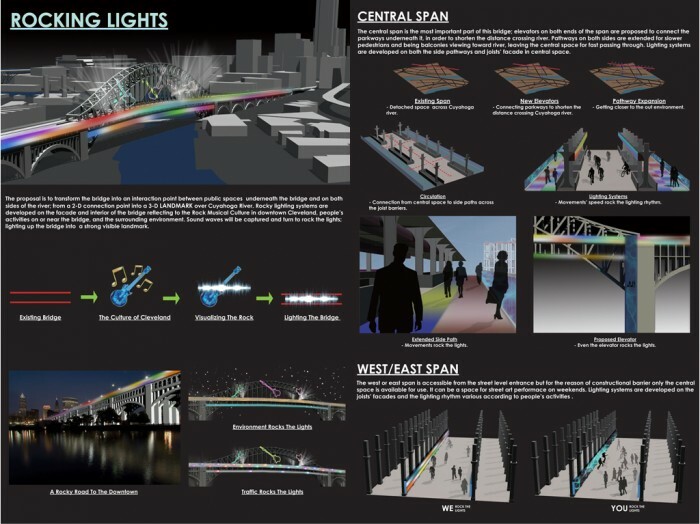 Overview: The proposal is to transform the bridge into an interaction point between public spaces underneath the bridge and on both sides of the river; from a 2-D connection point into a 3-D LANDMARK over Cuyahoga River. 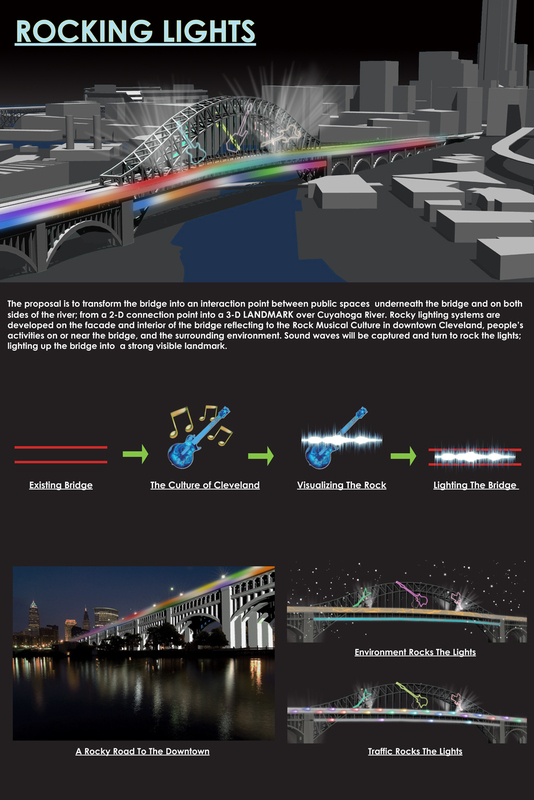 Rocky lighting systems are developed on the facade and interior of the bridge reflecting to the Rock Musical Culture in downtown Cleveland, people¡¯s activities on or near the bridge, and the surrounding environment. Sound waves will be captured and turn to rock the lights; lighting up the bridge into a strong visible landmark. When people going through the lower level of the bridge, their movements would also rock the lightings. Elevators on both ends of the central span are proposed to connect the parkways underneath the bridge, in order to shorten the distance crossing river. Pathways on both sides are extended for slower pedestrians and being balconies viewing toward river, leaving the central space for fast passing through. Lighting systems are developed on both the side pathways and joists¡¯ facade in central space. 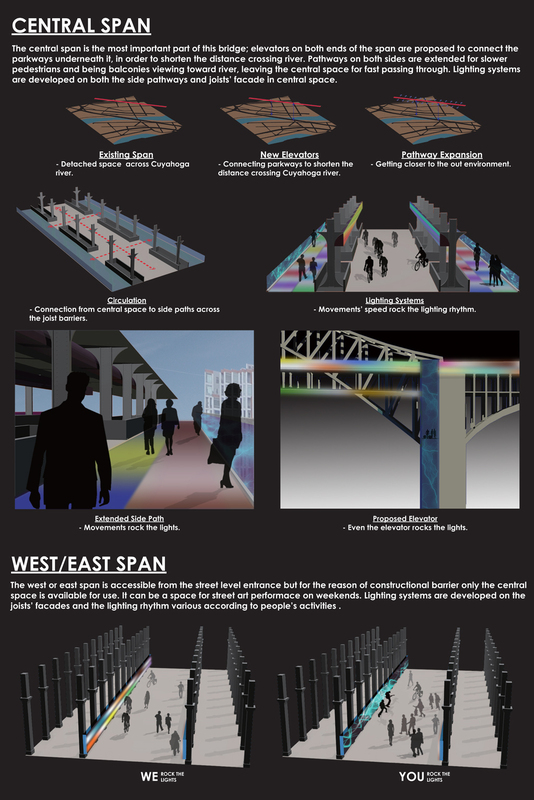 The west or east span is accessible from the street level entrance but for the reason of constructional barrier only the central space is available for use. It can be a space for street art performance on weekends. Lighting systems are developed on the joists¡¯ facades and the lighting rhythm various according to people¡¯s activities .